In drupal 7 we have something called contextual links. It is that little wheel you see when you hover over blocks so you can edit them in place. It is a great usability improvement but it is not always that clear how to implement them. The contextual links functionality used to be a contrib module in d6 now it is a core module. Let me explain what happens. All the links with a type MENU_LOCAL_TASK (as defined in their respective hook_menu) and a context MENU_CONTEXT_INLINE underlying the path node are fetched. The simple entry in the #contextual_links array will fetch all the node local taks. Look to how the node module defines node/%node/edit and node/%node/delete and it will be clear. This means you cannot fetch just any link defined in hook_menu, only the local task with a context inline will work for contextual links. Next we need a hook theme to implement our elements theme wrapper. In a preprocess file we can assign our variables. Now the only thing we need a little template file to print it all. Here we can see we printed the $classes which will contain the contextual link classes. The contextual links are filled in by the render function. The actual links you ll find in $title_prefix, also put in place by the render function. By rendering that array the html for the links will be printed. The jquery added by the contextual_links module will transform all arrays with the correct classes to the little wheel you can click. In the example we will add our links in the hook_menu and with a hook_block_view_alter we will change the render array of the blocks and add our links to it. // An example contextual link menu item. // To use local task menu items, there must be a parent page. // contextual link to it. points to what we defined in the hook_menu fetches everything underneath the path 'contextual' and the $block->module is the argument passed. If we would want to add these links to our custom element in previous example the only thing needed would be to adding them to the array. //On $something_usefull you ll need to put something so your function contextual/%/information knows what to do in the given context. // Add a link to all contextual links for nodes. Of course this will only work for existing paths on existing elements. We implemented the views_view_field preprocess hook and we wrapped the contextual links around our field we are displaying in the interface. Since the slide in slideshow is a node we can use the nid as argument to call for the correct contextual links allowing us to edit/delete the slide shown. This one is less clean because you can only add one item like this. In theory it would be possible to add it to the table row but this mean adapting the jquery from contextual links to also target tr elements, in the core it only targets div elements, putting them around tr elements is not valid html. We added a menu callback to register local actions to add each model. In the callback we query the type and we make it go to the add page. This way when we create a render array the contextual links to not only edit and delete but also the add link will be present. 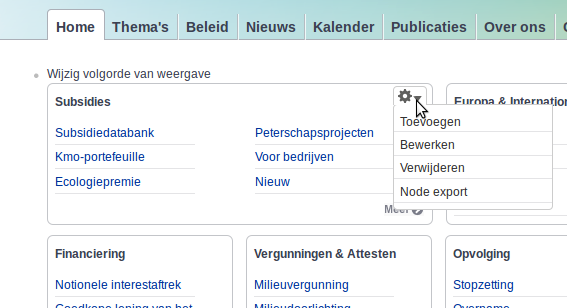 The slides are nodes so in the screenshot above you can "Toevoegen" Which means "Add" in dutch. This was caused by the last piece of code. I m sure they are lots of other methods to add contextual links. So I you have any post them in the comments. Just not sure where you are actually changing that field's value. Directly on the entity object? And $name should be $field_name? I tried your solution however it is not working for me. 1. glue_modal_operator_callback(): The switch statement after the comment "//Access checks to make sure the user has access ot the field collections" is entirely invalid. You need to have a FieldCollectionItemEntity available at that time, and all you have are the string parameters from the url -- there is no code prior to the statement to convert any of those parameters to a FieldCollectionItemEntity. In addition, field_collection_item_access() is looking for the strings "create", "update", "delete" or "view", not "add" or "edit". So a different access checking routine needs to be implemented at this point. 2. "operator" is misspelled in several places as "opertor"
3. The page displaying the node and Field Collection information never refreshes to reflect any changes to the Field Collection made in the form presented by the modal. In glue_modal_operator_callback() in the "if" statement right before the call to print ajax_render() and after the statement $commands = ctools_modal_command_dismiss(), you can add a second $command: $commands = ctools_ajax_command_reload() to reload the underlying node view page. 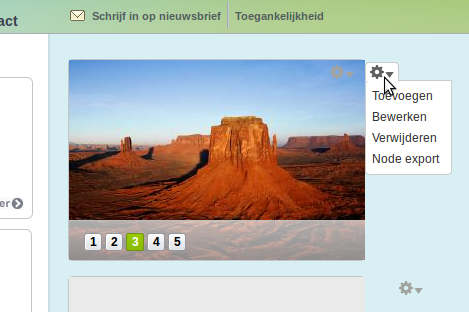 Alternatively, you can refresh the page contents via ajax and avoid a page reload. 4. The last code snippet in your post, function "synergie_field_attach_view_alter" should be named "glue_field_attach_view_alter". Other than that, thanks for your hard work!